Diana has been working with Lovelane’s program since 2010. After working in the barn and the ring as a volunteer for two years, she fell in love with the program and became an instructor in 2012. Diana has her Massachusetts and PATH International teaching licenses. Diana grew up in England and went to school there for Hotel Management. After university, Diana became the private cook to the head of MI6 (The British Secret Intelligence Service). After getting married, she moved to America in 2001. At Lovelane, Diana’s favorite activity is leading her riders down our trail. 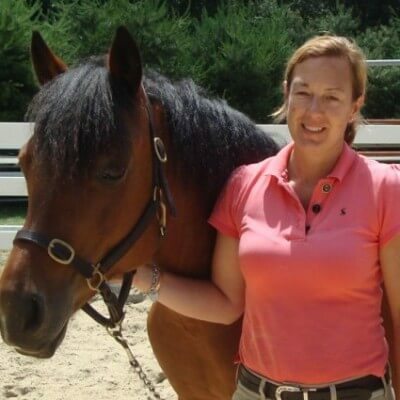 She loves showing her students the beauty of the outdoors and seeing the benefits new stimuli can bring riders. For Diana, Lovelane puts everything in perspective. Teaching here is special to her because she gets to experience everything in one minute. She thinks the people who surround her at the barn are amazing and she is inspired by them.